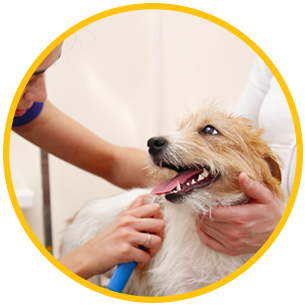 Keep your dog clean, healthy, and comfortable with specialized grooming services from Journey's Elite Stress Free Dog Grooming. Based in Santa Fe, New Mexico, we offer a calming environment and reiki treatment to help your dog relax. This is a no-touch healing-energy process that helps with your pet's psychological issues. With us, your dog is a member of our family too. Because groomers are often under-staffed, under-trained, and use out-of-date equipment, many pets experience injury that can sometimes lead to death. We offer services by appointment only instead of dog boarding, so each dog gets special, undivided attention. Our shop is also equipped with the latest technology to ensure safety regulations are being followed properly. As an extra precaution, all animals must be up-to-date and current on shots. Call us to learn more.